A delicious blend of Keenum and Ceylon tea with an accumulation of festive flavours including; baked apple, cinnamon, almond, star anise and vanilla pieces. With a warming walnut and cinnamon scent, this is sure to make any tea lover feel cosy and ready for winter, brew for 3-5 and enjoy in the evenings. 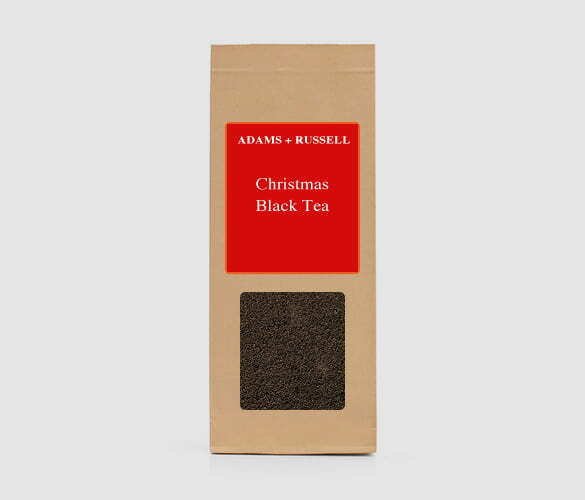 This Christmas loose leaf is a delicious blend of our favourite Christmas flavours and black tea. Keenum and Ceylon are combined for the black tea, which gives a distinctive flavour and a little boost of energy from the caffeine content. With festive flavours including baked apple, cinnamon, almond, star anise and vanilla, this is a great blend to share with friends and family during the Christmas period. A warming walnut and cinnamon aroma will fill your kitchen whilst brewing, spreading the Christmas spirit throughout your home! Ceylon comes all the way from Sri Lanka. The country was known as Ceylon until 1948, when it was renamed as Sri Lanka. Ceylon is one part of three that makes up our English Breakfast loose leaf. It is known for its strength, malty flavour and pleasant aroma. Diabetes – It has been shown to reduce blood glucose levels, which can be very helpful for those who suffer with diabetes. Skin – The antioxidants which can be found in Ceylon leaves are great for you skin and help to reduce the loss of collagen. Heart – The potassium content can help to keep your heart healthy. Keenum is a Chinese black tea. It was introduced to China in the 19th century and soon became popular across the country. It is now mainly used in blends. However, its distinctive floral, malty and slightly smoky flavour can still subtly be tasted. These unique characteristics gives the drink an overall mellow and smooth quality, which combines perfectly with the wonderful festive flavours. This recipe is a great way to indulge during Christmas and is a delicious alcohol-free option. Combine the water, cloves and cinnamon stick in a saucepan. Bring to the boil and then remove from the heat. Place the Christmas loose leaves (or teabags) into the saucepan and steep for ten minutes. In another saucepan combine the sugar, orange juice and lemon juice. Bring to a boil and then remove from the heat. Strain the tea into the orange juice mixture. Chill, serve over ice and enjoy! If you are looking for a gift for the tea lover in your life, the Adams and Russell gift set is the perfect present. With a luxury glass tea pot, silver scoop spoon and 3 bags of fresh tea of your choice, you can personalise it to suit their preferences. With up to 35% off and while stocks last, have a look at our Tea Gift Set here.